Blending GameKing quality graphics with a ridiculously convoluted game selection process that makes the Nintendo E-Reader seem practical! 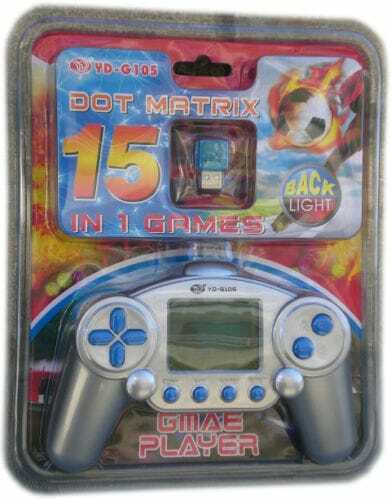 The 45-in-1 Game Player is perhaps the most head scratching device released this decade. Here at Obsolete Worlds, we are unashamed fans of the Timetop GameKing. The sheer audacity of its existence in an era when the PSP was considered cutting edge makes it possibly our favourite example of digital obsolescence being pushed as a viable product to an actual market. Even if nobody was ever really sure who that market was supposed to be. Whoever they were (and a quick look at Ebay would currently suggest that Bulgarians top the poll! ), the people at YD seem to believe that they are still out there and that, furthermore, they would like the opportuity to play even lower quality GameKing style games with increasingly ridiculous gimmicks attached. You may have already witnessed Stuart Ashen's review of their shameless Nintendo DS style 4 in 1...but their efforts didn't end there, as evidenced below. 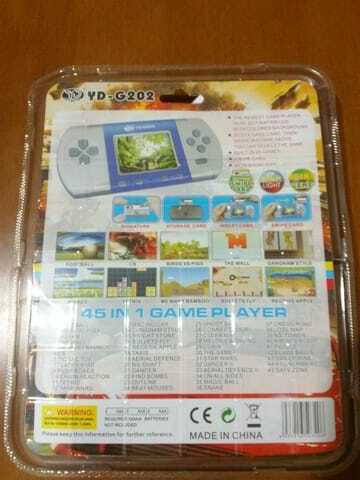 As the number of games has grown on YD's Handhelds, so has the bizarre method of selecting games, which includes fake keyboards and USB adapters! Wonderfully, their inability to spell the word "game" correctly has remained amusingly consistent. ﻿And so, things reach their natural zenith with the product we now find ourselves discussing. 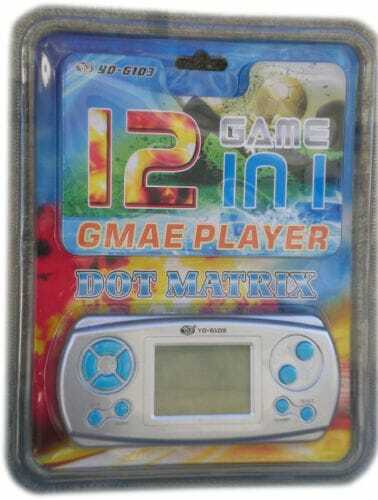 What appears to be the final evolution of the YD line before the company surprisingly went out of business: The 45-in-1 Game Player, with back light and "swipe card"...hmm. Perhaps, like us, you've tried the GameKing but can't be bothered with the logical method of plugging in a cartridge and pressing start to begin a game? Do you wish that there was a far more convoluted way to load up such classics as "Risker" and "Receive Apple" while also looking like a fancy millionaire with an important credit card? Thankfully the YD-G202 caters to such commonly requested features. Before we come to that, however, let's address the screenshots you can see on the back of the box, which display games that look something akin to those one might find on the Apple/Android stores. If you know anything about these devices then you should already be expecting disappointment and one look at the actual screen should already be guiding your thoughts towards an all too familiar piece of trickery: one so devious that Machiavelli himself is no doubt chuckling from beyond the grave at its inginuity. Yes, just like the GameKing II, they've gone and stuck a silly fixed colour background onto the back of the screen to try and give the same illusion of colour once experienced by your grandfather, when he bought one in a pub in 1965 to put over his black and white television on the grounds that it definately worked for watching the football! 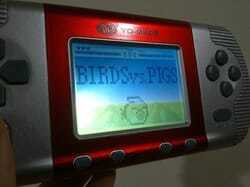 All your favourite games such as...erm..."Birds vs Pigs" are included. Yet another version of "Risker/Risk/Risk King". One day we will get to the bottom of this name. So unsurprisingly, the games are the usual short, dot matrix affairs, usually confined to 3 levels. 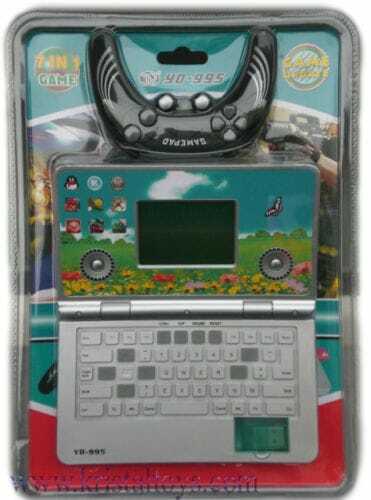 In many senses they are more primitive than the GameKing's efforts and most ape popular mobile phone games like Zuma, Angry Birds, etc or familiar classics like Super Mario Bros and Breakout. The background is, at least, less annoying than the one installed on the GameKing 2. In fact, it quickly pales in comparison with the most annoying thing about this system: It's utterly improbable method of switching games. Presenting the most ridiculous method of game selection ever devised by an actual human. If there is one thing that Chinese manufacturers seem to love, it's tricking users into thinking that one piece of plastic is interacting with another piece of plastic in order to "load" in a game. We've seen it countless times with cartridges that do little other than bridge a circuit to boot up roms contained within the device itself and this one really takes the cake. Make no mistake, all 45 games are preloaded into the handheld. 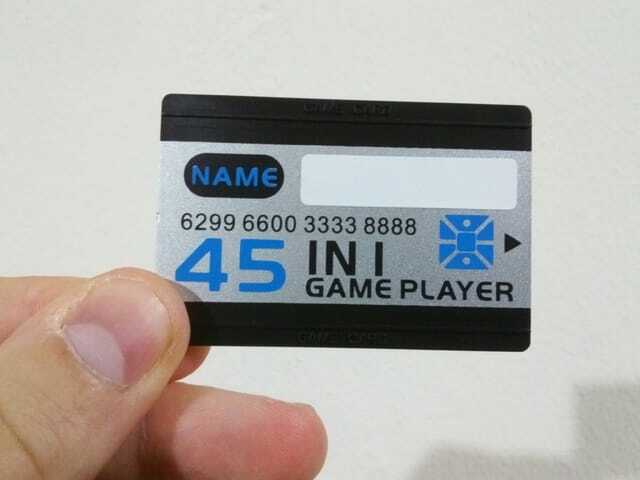 This little plastic card might as well be your actual credit card as all it does when pulled through the slot at the top of the machine is flick a microswitch inside the console and tell the device to change games. What a wonderful gimmick...thought nobody, ever. Well, at least they left a little stip for you to write offensive words on it, which is precisely what you may want to do if, for example, you want to play the 45th game on this device. For you see, switching on the system will automatically load up Game 1 (Football), to play Game 2 (Angry Birds) you need to swipe the card, a further swipe is needed to play Game 3 (Breakout) and so on. Yes, instead of being able to flick thorugh a menu and select your game, you need to individually swipe the card up to 45 times to load up all of the games, to the extent that, by the time you get there your friends and family will think you are some sort of demented check-out attendent at the supermarket (as opposed to a person who buys silly Chinese junk from Aliexpress). Fortunately, the vast majority of the games are terribly simplistic things that you won't want to bother with. Sound on the system is nice and loud but also repetetive, with recycled tunes and effects in most games. There is no volume slider but instead the system offers three settings (Very loud, loud and off). 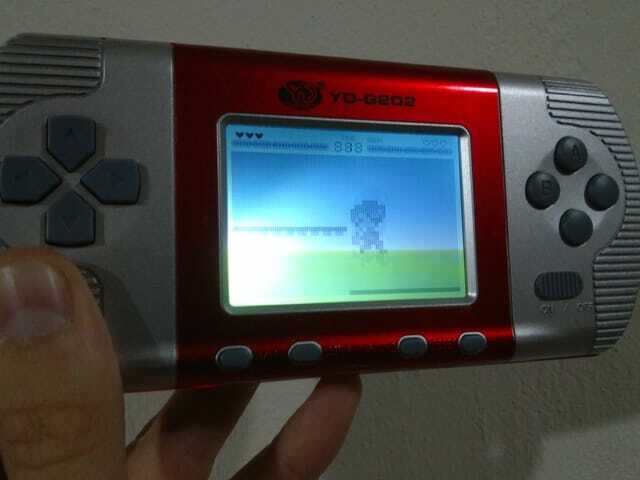 This appears to be the last handheld that YD made before folding. If you're a GameKing afficionado, like us, then it might be worth picking up on the cheap. It's certainly an interesting conversation piece, but, once again, it raises questions as to exactly what is going through the minds of people with a clear talent for electronics but with all the design skills of a half eaten potato.